But tonight, as four years ago, the contenders appeared between the second and third quarters of the Philadelphia Eagles-New Orleans Saints game. “The candidates are going where the viewers are tonight,” James Miller, co-author of the ESPN oral history Those Guys Have All The Fun, explained to me. ESPN’s Monday Night Football broadcasts routinely net more than 10 million viewers. He added, “ESPN is paying the NFL $1.1 billion this year for the rights to carry the game.” Hey, that’s like what each campaign cost! On the other hand, when Berman asked Mitt Romney about his experience as chief of the 2002 Salt Lake City Olympics, the question seemed obvious only in retrospect: the Winter Games are a crucial part of Romney’s mythology, but they are always presented entirely as a management problem. Romney may as well have been running an IT conference featuring thousands and thousands of youthful attendees from nearly 200 countries around the world. True to form, Romney’s answer had something to do with the “human spirit.” He did announce fealty to the New England Patriots, acknowledging what so much of his campaigning over the past six years has strived to deny: that he has lived in Massachusetts for four decades. Those looking for a takeaway will examine the candidates’ responses to the question: what about sports should you change? Obama was banal: the college football playoffs should have eight teams, not four (as is currently planned). Romney cited the continued culture of illicit performance enhancing substances. This is actually what Sen. John McCain—an actual sports fan who has fought, correctly if a bit irrelevantly, for the great boxer Jack Johnson’s pardon—cited four years ago. It’s possible this distinction Says Something: that Obama cares about improving the system for most while Romney cares about cracking down on the cheaters. More likely, though, these were the safe, deflecting answers for two men who just wanted a tiny bit of humanizing, free advertising (and who could not let the other one be the only one to do it). In Those Guys Have All the Fun, it is intimated that the candidates’ appearances four years ago had a marginal effect on the political outcome: “Everybody thought it was cool,” Berman says. “Several people changed their vote because they said McCain was nicer to me than Obama was.” That quote tells you just about everything you need to know about the sports-politics analogy. 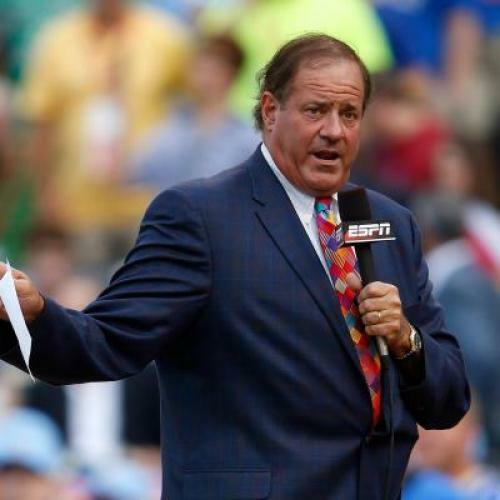 And also everything you need to know about Chris Berman.